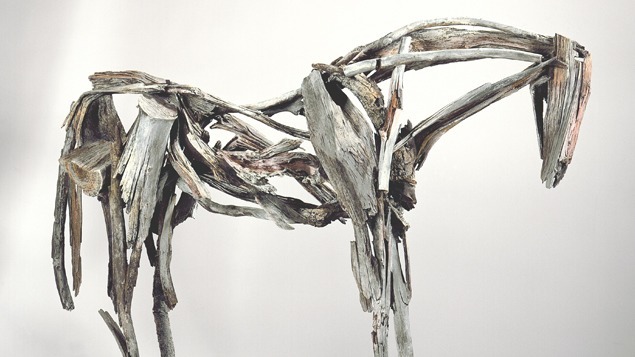 The Nevada Museum of Art presents an in-depth survey of the artwork of internationally acclaimed Montana sculptor, Deborah Butterfield. This exhibit offers a comprehensive overview of Butterfield’s magnificent large-scale sculptures. Horses have been the single, sustained focus of Butterfield’s work for over 20 years—a remarkably prolonged, disciplined and ultimately poetic inquiry into our relationship with the organic world, with other life forms and with ourselves. Her early work, fragile forms created from mud, sticks and straw, as well as full-sized horses constructed of sticks and found metal, evoked horses either standing or resting on the ground. Since the mid-1980s she has been creating full-size and smaller works from sticks and branches, and casting the finished sculpture in bronze. Furthermore, her work has special meaning in Montana, where she has chosen to make her home. The horse is a key part of Western culture and mystique, and Butterfield has captured its spirit and beauty in a way that speaks clearly to all who view her art. She has been exhibited all across the United States and in Europe, her work is widely collected by private individuals and museums and she has been commissioned by a number of significant museums and public sites. Butterfield is arguably the most important female sculptor working today.